We live in a connected world, and representing connected data shouldn’t feel odd. Enter the graph database: a flexible and expressive model that ditches table-based schemae in favor of a more natural approach that treats connections as first-class citizens. 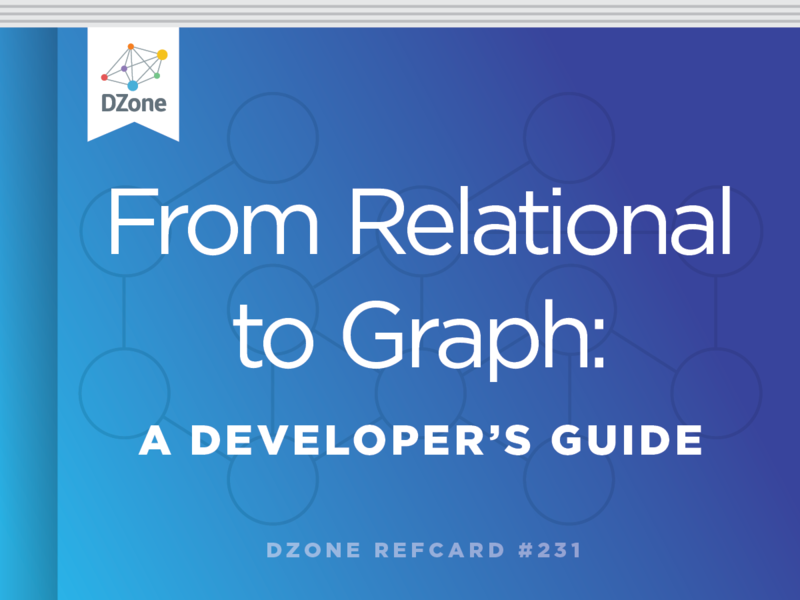 In this Refcard, developers familiar with relational databases will get an introduction to the wonderful world of graph databases with working examples in Neo4j. Today's business and user requirements demand applications that connect more and more of the world's data, yet still expect high levels of performance and data reliability. Many applications of the future will be built using graph databases like Neo4j. This Refcard was written to help you—a developer with relational database experience—through every step of the learning process. We will use the widely adopted property graph model and the open Cypher query language in our explanations, both of which are supported by Neo4j. For several decades, developers have tried to manage connected, semi-structured datasets within relational databases. But, because those databases were initially designed to codify paper forms and tabular structures—the "relation" in relational databases refers to the definition of a table as a relation of tuples—they struggle to manage rich, real-world relationships. The Northwind application exerts a significant influence over the design of this schema, making some queries very easy and others more difficult. While the strength of relational databases lies in their abstraction— simple mathematical models work for all use cases with enough JOIN— in practice, maintaining foreign key constraints and computing more than a handful of JOINs becomes prohibitively expensive. Although relational databases perform admirably when asked questions such as "What products has this customer bought?," they fail to answer recursive questions such as "Which customers bought this product who also bought that product?" Graph databases are unlike other databases that require you to guess at connections between entities using artificial properties such as foreign keys or out-of-band processing like MapReduce. In the graph model, however, relationships are first-class citizens. 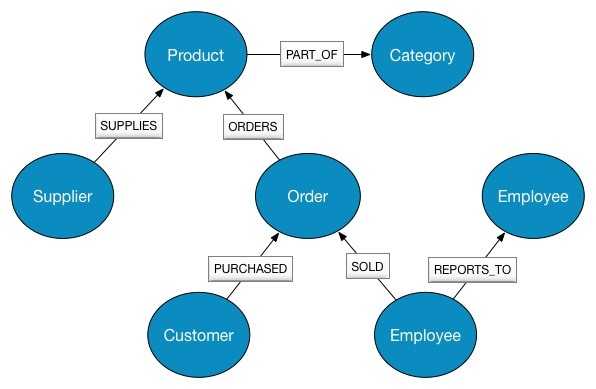 Creating connected structures from simple nodes and their relationships, graph databases enable you to build models that map closely to your problem domain. The resulting models are both simpler and more expressive than those produced using relational databases. JOIN-intensive query performance in relational databases deteriorates as the dataset gets bigger. In contrast, with a graph database, performance tends to remain relatively constant, even as the dataset grows. This is because queries are localized to a portion of the graph. As a result, the execution time for each query is proportional only to the size of the part of the graph covered to satisfy that query, rather than the size of the overall data. 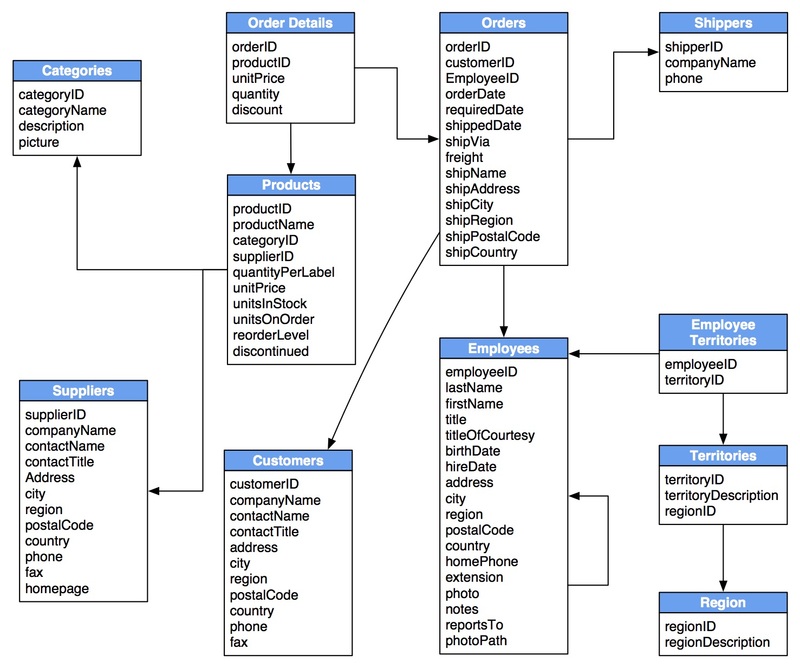 If you're experienced in modeling with relational databases, think of the ease and beauty of a well-done, normalized entity-relationship diagram: a simple, easy-to-understand model you can quickly whiteboard with your colleagues and domain experts. A graph is exactly that: a clear model of the domain, focused on the use cases you want to efficiently support. How does the Northwind Graph Model Differ from the Relational Model? Relationships are more detailed. For example, it shows an employee SOLD an order without the need of an intermediary table. Neo4j provides a bulk import tool that can import billions of nodes and relationships. It utilizes all CPU and disk resources, adding at least one million records per second into the database. It consumes large, also compressed CSV files with a specific header configuration to indicate mapping instructions. Files can be repeatedly used for both nodes and relationships. A header that provides information on the data fields must precede each input. Header and raw data can optionally be provided using multiple files. Fields without corresponding information in the header will be ignored. Indexes are not created during the import. Bulk import is only available for initial seeding of a database. The import tool assumes that node identifiers are unique across node files. If this isn't the case then you can define groups, defined as part of the ID field of node files. For example, to specify the Person group you would use the field header ID(Person) in your persons node file. You also need to reference that exact group in your relationships file, i.e., START_ID(Person) or END_ID(Person). Use the LABEL header to provide the labels of each node created by a row. In the Northwind example, one could add a column with header LABEL and content Supplier, Product, or whatever the node labels are. As the supplier.csv file represents only nodes for one label (Supplier), the node label can be declared on the command line. 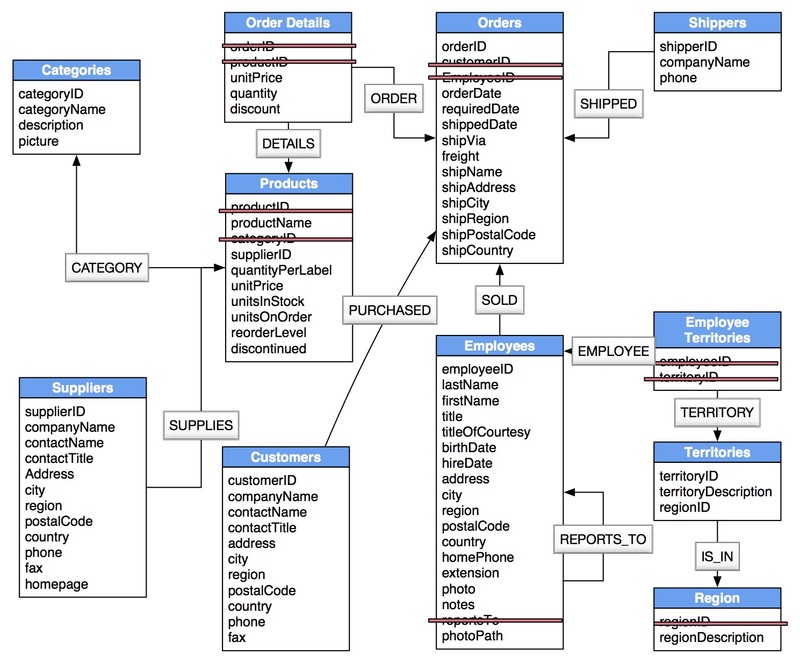 In the case of this dataset, the products.csv export from the relational database can be repurposed to build the (:Supplier)-[:SUPPLIES]->(:Product) relationships in the graph database. As every row in the input file is of the same relationship type, the TYPE is set on the command line. Now that the graph has data, it can be updated using Cypher, Neo4j's open graph query language, to generate categories based on the categoryID and categoryName properties in the product nodes. The query below creates new category nodes and removes the category properties from the product nodes. Cypher is about patterns of relationships between entities. Just as the graph model is more natural to work with, so is Cypher. Borrowing from the pictorial representation of circles connected with arrows, Cypher allows any user, whether technical or non-technical, to understand and write statements expressing aspects of the domain. 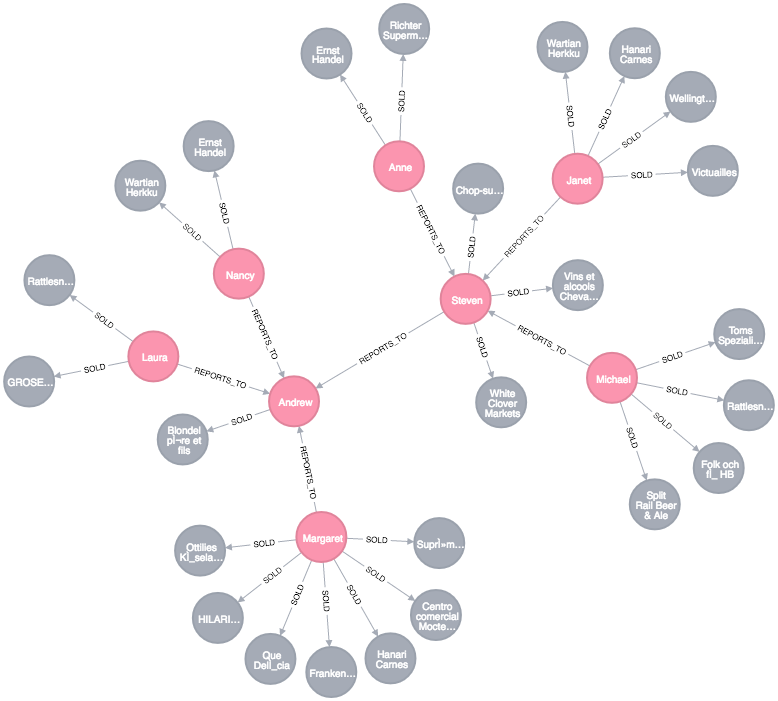 Graph database models not only communicate how your data is related, but they also help you clearly communicate the kinds of questions you want to ask of your data model. Graph models and graph queries are two sides of the same coin. In SQL, just SELECT everything from the products table. In Cypher, MATCH a simple pattern: all nodes with the label :Product, and RETURN them. It is more efficient to return only a subset of attributes, like ProductName and UnitPrice. You can also order by price and only return the 10 most expensive items. You can also use any other kind of predicates: text, math, geospatial, and pattern comparisons. Read more on the Cypher Refcard. To ask the relational Northwind database What have I bought and paid in total? use a similar query to the one above with changes to the filter expression. 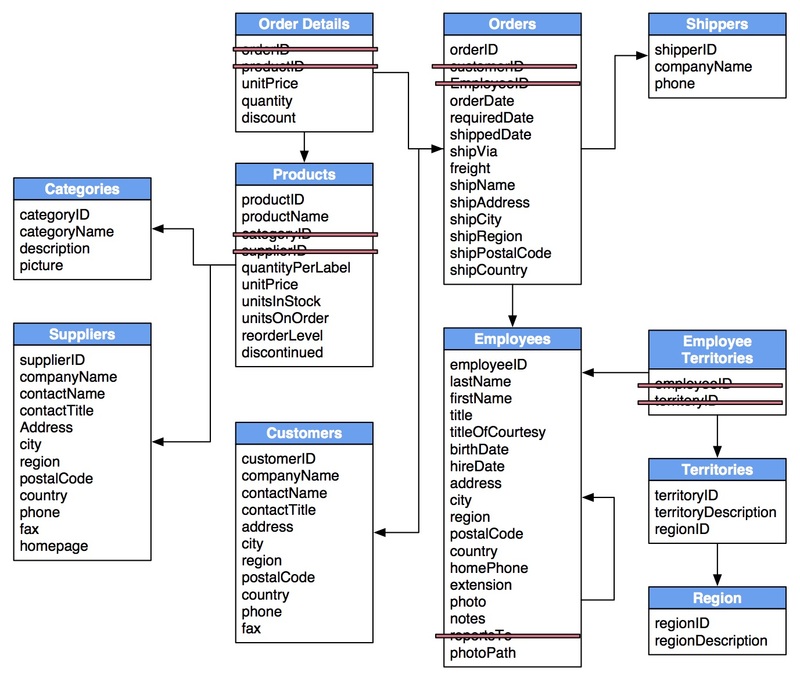 However, if the database has customers without any orders and you want them included in the results, use OUTER JOINs to ensure results are returned even if there were no matching rows in other tables. In the Cypher query, the MATCH between customer and order becomes an OPTIONAL MATCH, which is the equivalent of an OUTER JOIN. The parts of this pattern that are not found will be NULL. As you can see, there is no need to specify grouping columns. Those are inferred automatically from your RETURN clause structure. When it comes to application performance and development time, your database query language matters. SQL is well-optimized for relational database models, but once it has to handle complex, connected queries, its performance quickly degrades. In these instances, the root problem lies with the relational model, not the query language. For domains with highly connected data, the graph model and their associated query languages are helpful. If your development team comes from an SQL background, then Cypher will be easy to learn and even easier to execute. Unique constraints serve two purposes. First, they guarantee uniqueness per label and property value combination of one entity. Second, they can be used for determining nodes of a matched pattern by property comparisons. Note that a constraint implies an index on the same label and property. These indices will ensure speedy lookups when creating relationships between nodes. 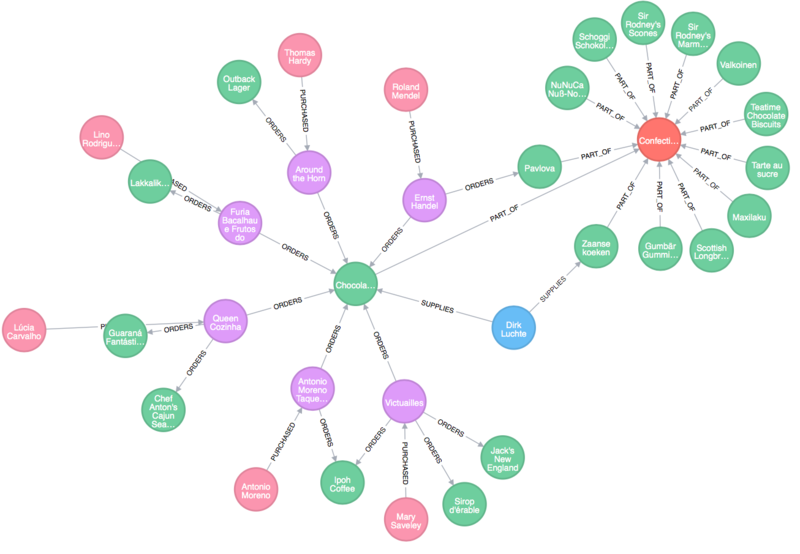 To quickly find a node by property, Neo4j uses indexes on labels and properties. These indexes are also used for range queries and text search. To update the graph data, find the relevant information first, then update or extend the graph structures. Find Steven, Janet, and Janet's REPORTS_TO relationship. Remove Janetâ€™s existing relationship and create a REPORTS_TO relationship from Janet to Steven. This single relationship change is all you need to update a part of the organizational hierarchy. All subsequent queries will immediately use the new structure. If you've installed and started Neo4j as a server on your system, you can interact with the database via the console or the built-in Neo4j Browser application. Neo4j's Browser is the modern answer to old-fashioned relational workbenches, a web application running in your web browser to allow you to query and visualize your graph data. Bolt is a connection-oriented protocol that uses a compact binary encoding over TCP or web sockets for higher throughput and lower latency. The API is defined independently of any programming language. This allows for a high degree of uniformity across languages, which means that the same features are included in all the drivers. The uniformity also influences the design of the API in each language. This provides consistency across drivers, while retaining affinity with the idioms of each programming language. You can download the driver source or acquire it with one of the dependency managers of your language. For other build systems, see information available at Maven Central. Ask the database object for a new driver. Ask the driver object for a new session. Use the session object to run statements. It returns a statement result representing the results and metadata. Process the results, optionally close the statement. 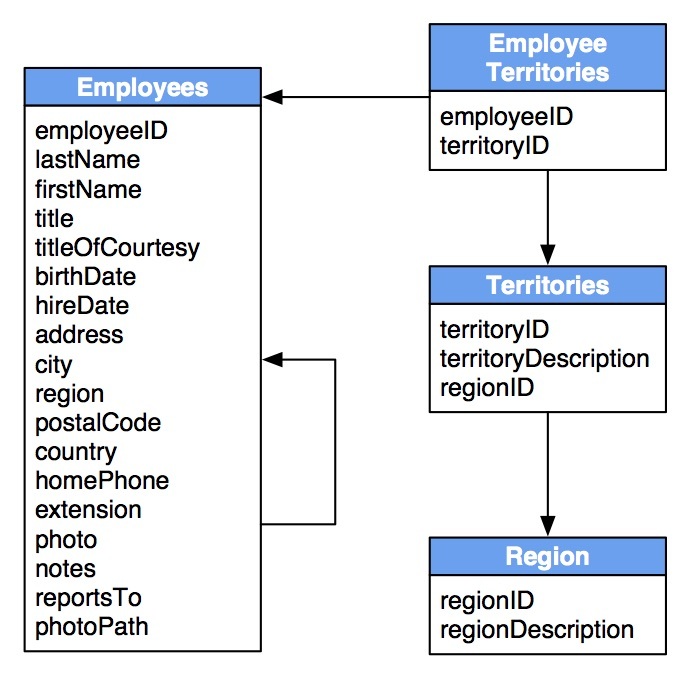 If you’re a Java developer, you’re probably familiar with Java Database Connectivity (JDBC) as a way to work with relational databases. This is done either directly or through abstractions like Spring’s JDBCTemplate or MyBatis. Many other tools use JDBC drivers to interact with relational databases for business intelligence, data management, or ETL (Extract, Transform, Load). Cypher—like SQL—is a textual and parameterizable query language capable of returning tabular results. 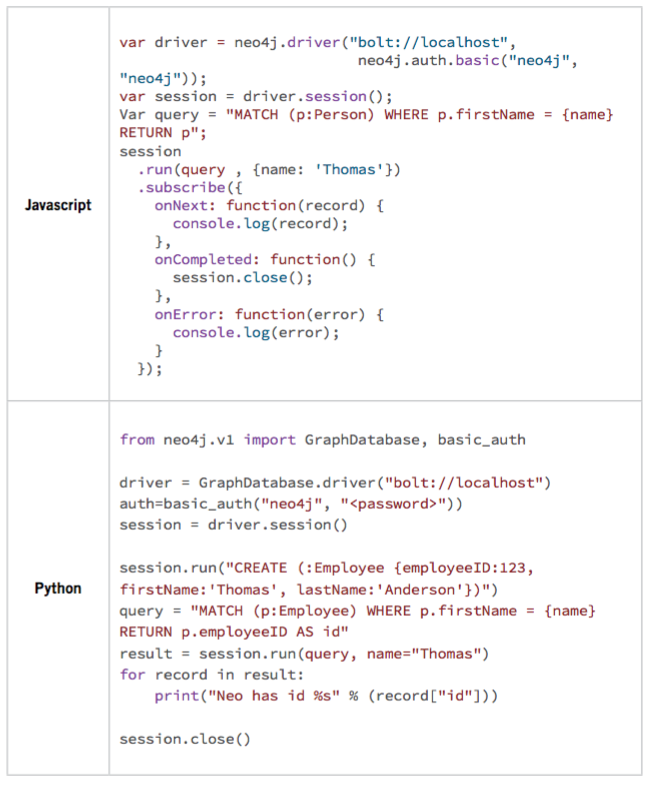 Neo4j easily supports large parts of the JDBC APIs through a Neo4j-JDBC driver. The Neo4j-JDBC driver is based on the Java driver for Neo4j’s binary protocol and offers read and write operations, transaction control, and parameterized prepared statements with batching. Make sure to develop a clean graph model for your use case first, then build a proof of concept to demonstrate the added value for relevant parties. This allows you to consolidate the import and data synchronization mechanisms. When you're ready to move ahead, you'll integrate Neo4j into your architecture both at the infrastructure and the application level. Deploying Neo4j as a database server on the infrastructure of your choice is straightforward, either in the cloud or on premise. You can use our installers, the official Docker image, or available cloud offerings. For production applications you can run Neo4j in a clustered mode for high availability and scaling. As Neo4j is a transactional OLTP database, you can use it in any end-user facing application. Using efficient drivers to connect from your applications to Neo4j is no different than with other databases. You can use Neo4j's powerful user interface to develop and optimize the Cypher queries for your use case and then embed the queries to power your applications. If you augment your existing system with graph capabilities, you can choose to either mirror or migrate the connected data of your domain into the graph. Then you would run a polyglot persistence setup, which could also involve other databases, e.g., for textual search or offline analytics. 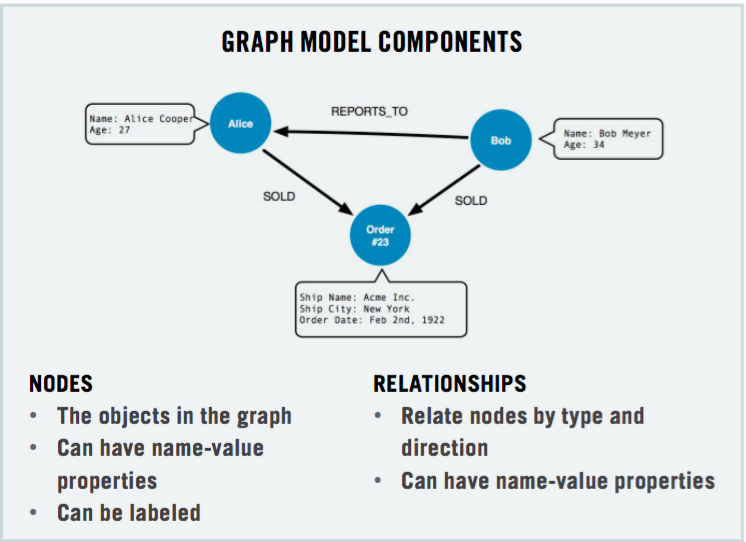 If you develop a new graph-based application or realize that the graph model is the better fit for your needs, you would use Neo4j as your primary database and manage all your data in it. For data synchronization, you can rely on existing tools or actively push to or pull from other data sources based on indicative metadata. 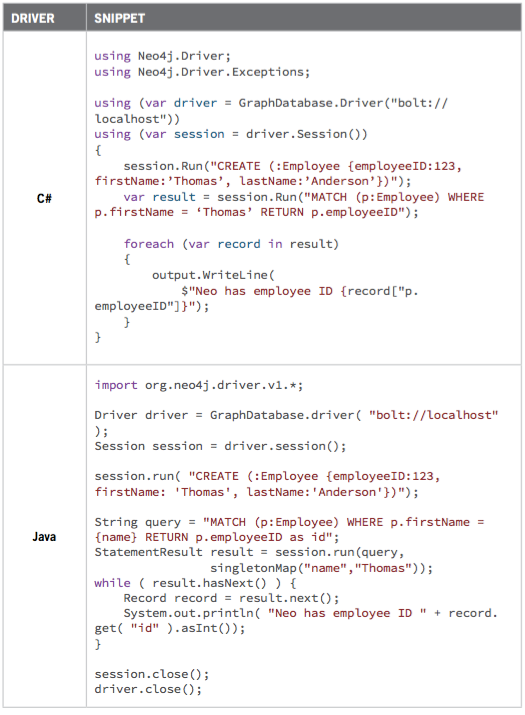 Neo4j JDBC Driver 3.x: Bolt it with LARUS! For several decades, developers have tried to manage connected, semi-structured datasets within relational databases. But, because those databases were initially designed to codify paper forms and tabular structures—the \"relation\" in relational databases refers to the definition of a table as a relation of tuples—they struggle to manage rich, real-world relationships. 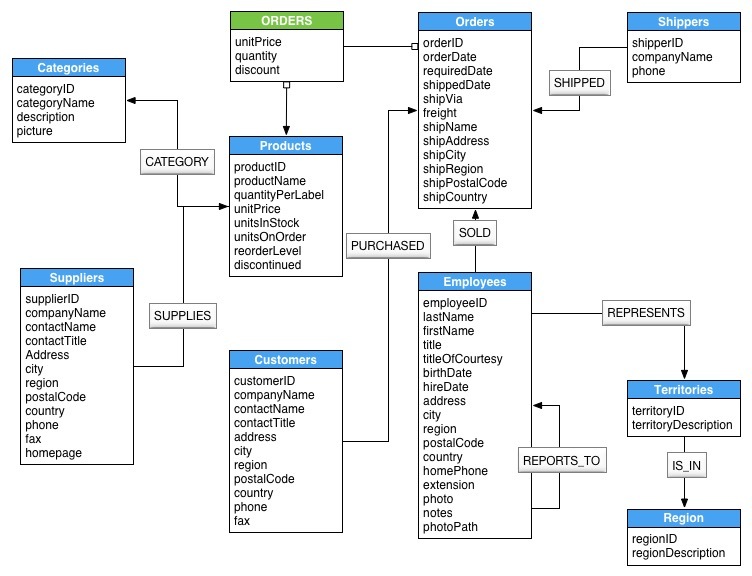 Although relational databases perform admirably when asked questions such as \"What products has this customer bought?,\" they fail to answer recursive questions such as \"Which customers bought this product who also bought that product?\"